We had a fun little conversation a couple of weeks ago on Facebook about how good Rice Krispie treats would be with the new pumpkin spice marshmallows. Well someone finally tried pumpkin spice Rice Krispie treats out and kicked them up a couple of notches by adding peanut butter and chocolate too. 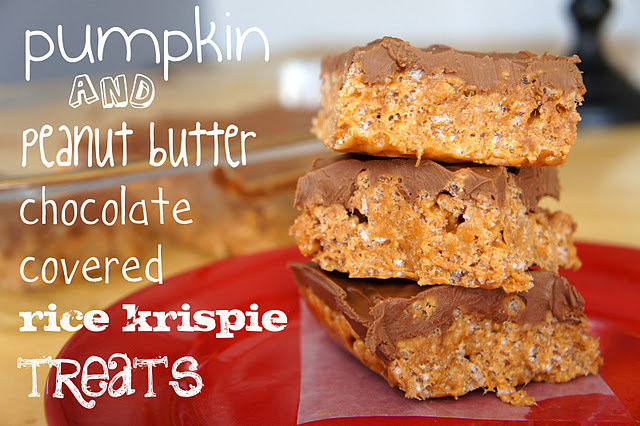 You can check out the recipe for these pumpkin and peanut butter chocolate covered Rice Krispie treats over at I Wash...You Dry.